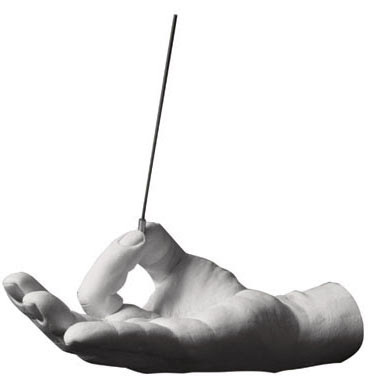 The Om Hand Hook was designed by Harry Allen for Areaware. Harry Allen's Om Hand Hook was cast from the designer's hand. The result is a unique and functional new design object for the home. The Om Hand Hook is an incense burner which catches the incense ash in the palm of the hand. All Hand Hooks are made of gypsum white resin and marble and come complete with wall mounting hardware. Harry Allen's Om Hand Hook is a great unique gift idea. The Om Hand Hook is part of Harry Allen's Wall Hook series which are all based on highly detailed casts of designer Harry Allen's hands. These wall hooks are perfect home accessories. Harry Allen is an award-winning interior and industrial designer. Harry Allen designed a number of successful retail interiors throughout the United States and Asia. As a product designer he has worked for a very impressive group of clients, and received numerous awards. Harry Allen created several items for Areaware including the Hand Hook, Peanut Bowl, Roller Stop and Pig Bank.